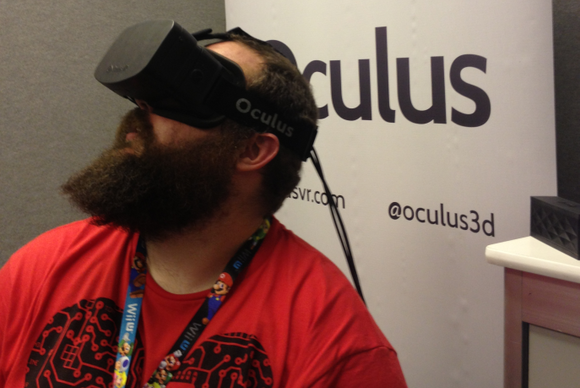 Oculus vs. Morpheus at E3 2014: Is virtual reality ready for prime time? The Oculus Rift and a renewed interest in virtual reality has prompted a panic about controls—how do you intuitively and accurately manipulate a game while wearing what's essentially a blindfold? Non-traditional controllers like Virtuix's Omni treadmill and the Razer Hydra are two attempts to answer that question. Now, you can add Trinity VR's Trinity Magnum, which launched a Kickstarter campaign today, to the list. The Trinity Magnum is—as the name implies—essentially a gun for your virtual reality warfare needs. 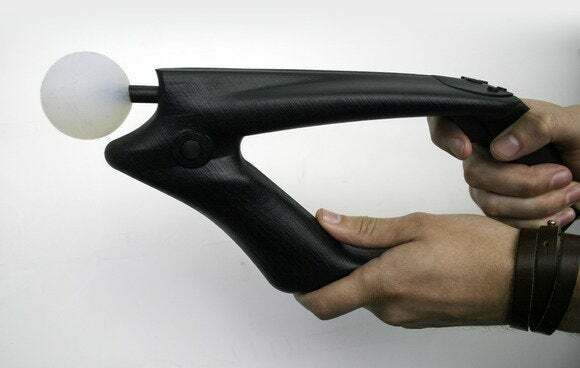 I've held gun controllers in my hand while demoing other Rift prototypes, but none have been virtual reality-enabled. I could only shoot wherever I aimed my head. The Magnum is the first custom-made (a.k.a. not just hacked together) device I've used that divorces "where I'm looking" from "where I'm shooting" by allowing the camera and aiming reticule to move separately. And it works well, for the most part. The gun is tracked by way of an external camera and internal hardware, and you're given full one-to-one movement reproduction. It looks like some sort of futuristic rifle mixed with a PlayStation Move controller. Our demo also used a PlayStation Eye camera, though the creators say the final product is platform agnostic and can use any camera of sufficiently high tracking speed and resolution. The Magnum has a trigger (naturally), a front analog stick, an analog stick on the rear-top panel, and four buttons. The analog sticks move in a flat plane, rather than tipping over like the balled analog sticks on a standard controller—if you've ever used the PlayStation Vita or Portable, you'll know what I mean. The sticks are uncomfortable, but you get used to the limited range of motion relatively quickly. I played through one demo that was essentially a static shooting gallery: blow up some gas cans, take out a few targets, and generally get used to the idea of aiming separately from where you're looking. Then I swapped over to a game by PixelRouter, called Z0ne, which was basically a three-dimensional rails shooter—you speed straight ahead while shooting everything in sight and trying to score points by some mysterious mechanic I never fully understood. Regardless, both demos were impressive showcases for the hardware. It's hard to accurately detect latency when using the now-antiquated first-generation Rift dev kit, but the Magnum seemed responsive. The trigger was a bit stiff, the analog sticks cheap-feeling, the buttons a bit of a stretch to reach, the front end too heavy—but hey, it's a prototype. The potential for a great product is there, and with plans to release for under $100 the Magnum seems a lot more viable for average consumers than the $500 Virtuix Omni or even the $130 Razer Hydra. But is the Trinity Magnum really more viable than its predecessors? There's an arcade convention in Santa Clara, CA every year called California Extreme. Pinball, classic arcade games, DDR—they've got it all. It's a magical place where you'll see a Defender cabinet next to a Swords of Fury pinball table next to a Street Fighter cabinet, and all set to free play. And one of the best aspects of California Extreme (and arcades in general) is getting a look at all the crazy control schemes: Tapper/Root Beer Tapper with its keg-tap handles, or Slick Shot with its faux-pool table, or Star Wars with its flight yoke. The best part of California Extreme, however, is that I don't have to own all these control schemes in my own house. How many of us still have plastic instruments stashed in a closet? Flight sticks? Light guns? The moment that sticks out to me most from the Trinity Magnum demo is when the creators tried to convince me the device is genre agnostic. It's not just for shooters—it's for everything. But it's shaped like a gun. It has a trigger like a gun. It's not very comfortable to hold in any position except the "This is clearly a gun" position. It's not that Trinity has made a bad product, with the Magnum. Far from it. The Magnum is more intuitive than a lot of the strange, awkward third-party controllers I've used since the Rift exploded onto the VR scene. It's responsive and solidly built. Are you willing to own six different controllers for your Rift, though? Or, if you are, is your best friend? Your sibling? Your cousin? Your parent? And with the Magnum requiring a separate SDK and a separate camera than the Rift (at the moment), how many games will wind up with Magnum support? Will it be able to play your favorite game? Will someone go back and allow the reticule to aim a different direction than the camera? Plus, CNET recently reported that Oculus is working on its own first-party controller—no surprise, after the recent acquisition of Carbon Design, the team that created the widely-acclaimed Xbox 360 controller, and considering that Oculus higher-ups have stressed the importance of inventing solid built-for-VR controls in the past. 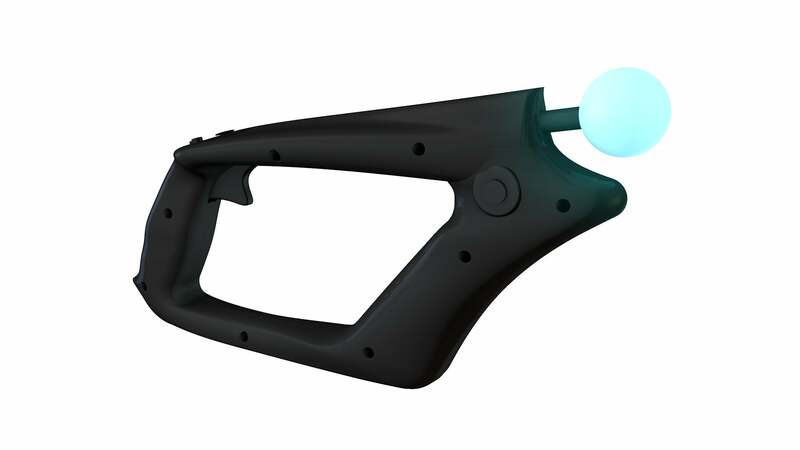 If the Oculus dev tools integrate support for this first-party controller, and it's something more genre-agnostic, the Magnum is automatically at a disadvantage, even if holding a gun-shaped controller is more immersive for shooting games. So, like everything in VR these days, we're left with a veritable pile of unknowns. The landscape of VR changes at such a rapid pace, it's hard to know where any of this is going. We know we need better controls, but where will they come from and what form will they take? The Magnum is an interesting prototype with a lot of potential, but I don't know if that's enough anymore. Let's not forget, the Rift isn't even officially available to the public yet, and a launch date for the eventual consumer release hasn't even been hinted at yet. Will the Magnum be useful? Or will it end up next to two Rock Band guitars and a half-broken drumset in my closet, if it even manages to meet its $60,000 Kickstarter goal? That's the true question raised by the VR control schemes we've seen to date, and until the Oculus Rift and the various accessories created for it start landing in the hands of everyday users, it's a question that can't truly be answered.